Next week we will get together with family and friends to enjoy food, family, and football for Thanksgiving. No matter if you are hosting or going to someone’s house you will need some fun and festive cocktails to make the night even better. So check out the four recipes below and please remember to enjoy responsibly. 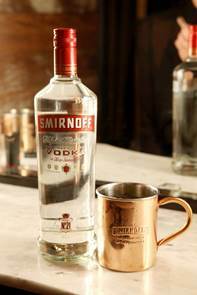 In a copper mug with ice, add SMIRNOFF No. 21 vodka, ginger beer and a squeeze of lime and stir. Garnish with a fresh lime slice. In a small pot, bring water and sugar to a boil. Drop in rosemary and cinnamon sticks and stir until sugar dissolves. Allow to cool completely. In a large pitcher, place fruit into the bottom. Top with SMIRNOFF Sourced Cranberry Apple, triple sec, wine and simple syrup. Stir to combine. Refrigerate for 6 hours up to overnight. 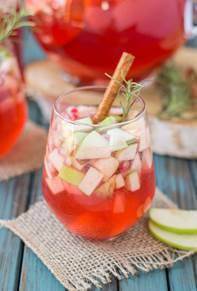 Garnish with a cinnamon stick, rosemary spring and/or frozen fruit. In a cocktail shaker, combine the Smirnoff Vodka, Ginger Beer, Apple Cider, and Simple Syrup and shake. Then rim a copper mug with caramel sauce. 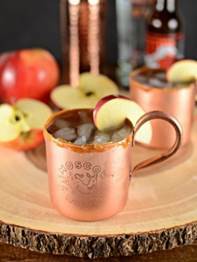 Pour cocktail over ice into the copper mug and garnish with an Apple Slice. Put copper mugs in freezer for 5 minutes to chill. 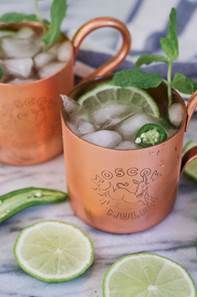 Squeeze lime juice and drop in 1-2 serrano pepper slices in copper mug. Use the back of a wooden spoon to muddle together the serrano slices and lime juice. Pour in vodka and stir. Fill copper mug with ice and top off ginger beer. Serve with additional serrano slices lime wedge, and mint sprig for garnish. Print article This entry was posted by Art Eddy III on November 15, 2016 at 1:59 pm, and is filed under Lifestyle. Follow any responses to this post through RSS 2.0. Both comments and pings are currently closed.